Product categories of Frozen Mixed Vegetables, we are specialized manufacturers from China, Frozen Mixed Vegetables, Mixed Vegetables Iqf suppliers/factory, wholesale high-quality products of Organic Mixed Vegetables R & D and manufacturing, we have the perfect after-sales service and technical support. Look forward to your cooperation! 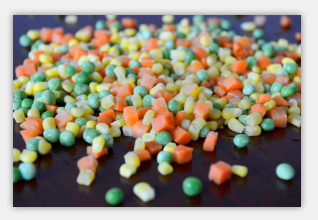 Our company treats fresh mixed vegetables in a frozen manner. This processing method makes the water in vegetables quickly form regular and fine ice crystals, evenly distributed in the cells, the vegetable tissue will not be destroyed, and the biochemical process inside the vegetables can not be carried out, so bacteria and molds can not develop. Quick-frozen food is very convenient to eat, get indoor without washing, cutting, slightly defrosting. Because most of the frozen vegetable products are cooked, and some may also add salt and other condiments, so cooking with a quick fire, instantly cooked, its taste, color and vitamin content, and fresh food almost the same.